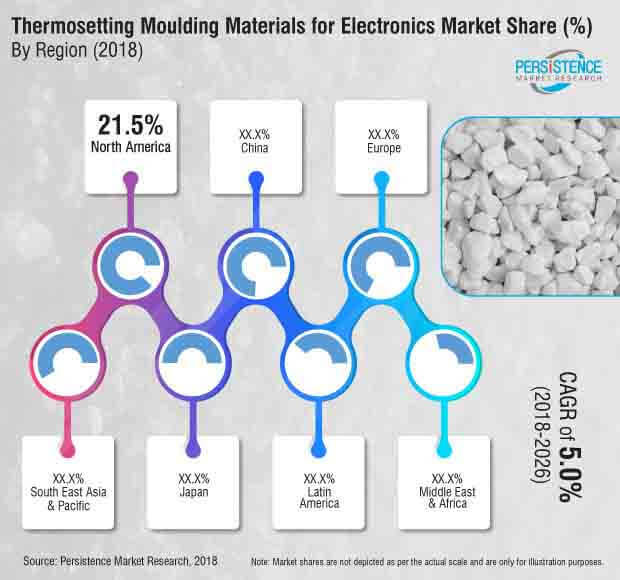 Persistence Market Research (PMR) provides an exclusive analysis of “Global Thermosetting Resin Moulding Materials for Electronics Market”. The main aim of this report is to offer exhaustive analysis and provide insights pertaining to the Thermosetting Resin Moulding Materials for Electronics market. This report offers a comprehensive analysis of the global Thermosetting Resin Moulding Materials for Electronics market in terms of volume (tons) & value (US$ Mn) and year-wise (Y-o-Y) growth in sales of Thermosetting Resin Moulding Materials for Electronics according to application and end use. For better understanding of market, report is loaded with analysis of factors such as drivers, trends, restraints, and their impact on the market dynamics. The Thermosetting Resin Moulding Materials for Electronics report is segmented into three sections viz. by base material, by application, and by region, to offer insights on the global Thermosetting Resin Moulding Materials for Electronics market. The global Thermosetting Resin Moulding Materials for Electronics market is estimated to be valued at US$ 1,139.3 Mn by 2018 end and is expected to reach US$ 1,685.6 Mn by the end of 2026, expanding at a CAGR of 5.0% over the forecast period. The global Thermosetting Resin Moulding Materials for Electronics market is anticipated to represent incremental opportunity of US$ 546.3 Mn between 2018 and 2026. The global High Purity Quartz is anticipated to increase to US$ 335.8 by 2026, exhibiting a CAGR of 5.6% over the forecast period. Thermosetting Resin Moulding Materials for Electronics resins are used for the manufacturing of printed circuit boards, prepregs and copper clad laminates, amongst others. With rise in demand for lighter, shorter, thermally stable and reliable circuit boards, Thermosetting Resin Moulding Materials for Electronics are gaining prominence in the digital world. Owing to good adhesion, high electrical insulation and mechanical and thermal stability properties of Thermosetting Resin Moulding Materials for Electronics resins, their use has grown significantly over the past decade. The number of PCBs (Printed Circuit Boards) manufactures using Thermosetting Resin Moulding Materials for Electronics resins installed in cars has grown exponentially over the past few years. With growing demand for autonomous vehicles, a rise in demand for such electronic components is expected to drive demand of resins for Thermosetting Resin Moulding Materials for Electronics resins. On the basis of base material, the global Thermosetting Resin Moulding Materials for Electronics market is segmented into High Purity Quartz (Lower Purity Grade, HPQ Powder, Grade I HPQ, Grade II HPQ and Grade III HPQ) and Competitive Products (Fumed Silica, Spherulised Fused Silica, Synthetic Silica, Crystal Silica and Ti, Al, Zr, Ferrite Powders). On the basis of application, the global Thermosetting Resin Moulding Materials for Electronics market is segmented into Epoxy, Polyester, Polyurethane, Polyimide, Formaldehyde, and melamine formaldehyde, Bakelite and Others. Among them, polycrystalline segment accounted for 85.2% share in 2017 in terms of value of the Thermosetting Resin Moulding Materials for Electronics. On the basis of end-use, the global Thermosetting Resin Moulding Materials for Electronics market is segmented into Consumer Electronics, Automotive and Aerospace. Consumer Electronics segment account for more than half of the overall Thermosetting Resin Moulding Materials for Electronics mark`et by the end of forecast period. The automotive industry uses Thermosetting Resin Moulding Materials for Electronics resins and curing agents for a number of applications, including protective coatings, adhesives, light weight composite materials and others. The new Thermosetting Resin Moulding Materials for Electronics resin materials technology provides superior rust and corrosion protection. Epoxy coatings are used in most of the modern cars. The Sales of Thermosetting Resin Moulding Materials for Electronics in Automotive segment is projected to represent a total incremental opportunity of US$ 77.0 Mn between 2018 and 2026 while the Aerospace end use segment is projected to expand at a moderate CAGR in terms of value over the forecast period. The margins across various grades of Thermosetting Resin Moulding Materials for Electronics vary greatly. As a result, the companies are looking to achieve high purity levels of Thermosetting Resin Moulding Materials for Electronics, to leverage the much anticipated semiconductor industry. The Thermosetting Resin Moulding Materials for Electronics market is expected to grow at attractive pace owing to high demand for epoxy moulding applications. The Asia Pacific region including China and Japan region is expected to gain traction in the Thermosetting Resin Moulding Materials for Electronics market. High Purity Quartz in Thermosetting Resin Moulding Materials for Electronics have limited suppliers that keeps profit margins in the industry are high. Some of the market participants reported in this study of global Thermosetting Resin Moulding Materials for Electronics market include Unimin-Sibelco, Samsung SDI Co. Ltd., Golovach Quartz, Momentive,, The Quartz Corporation, Kyocera Chemical Corporation, Tosoh Corporation, ANZAPLAN GmbH, HPQ Silicon, Jiangsu Pacific Quartz Co.,Russian Quartz LLC –Kyshtym Mining –Sumitomo, Nordic Mining ASA, CB Minerals and others. The major strategies employed by producers of Thermosetting Resin Moulding Materials for Electronics include product development and strengthening of sales and distribution infrastructure. For e.g. Hexion Inc., over the past few years has launched various water-borne and other resin formulations that reduce the curing time as well as VOC emissions. There has been a significant improvement in performance and these resins can be used over a wide range of application areas including electronic board filling material.